Successfully Added 4.3 Inch Touch Screen GPS Navigator (The Max Power Edition) to your Shopping Cart. 4.3 inch touch screen GPS navigator with Bluetooth and MP3/MP4 player, for the most enjoyable drive ever. Be amazed by the functionality and performance with this GPS navigator, it might look small, but it packs a heavy kick. This little dragon is filled with features that will bring you joy and happiness on your journeys. Navigate your way to stress free driving! The CVHW-CS13 is compact and very easy to install and operate. It features a flexible arm bracket for easy installation in your car. Not only can this new GPS navigation unit be used as a modern car GPS or portable media system, but it can also be used as your cars Bluetooth handsfree device. This portable 4.3" TFT LCD touch screen GPS unit will guide you and keep you entertained anywhere you need to go, whether in the city or country side. In addition, it comes with Win CE 5.0 operating environment, meaning it works with almost all of today’s popular GPS software packages, such as TomTom, Route66, etc. With its additional rich media features, when you are on a long journey or camped down for the night, this unit can also be used as a convenient media player to play your audio and video files. The CVHW-CS13 is designed with care to provide the user with a simple menu navigation system. This unit even has an earphone jack and mini-USB to enhance its everyday usefulness. Makes an excellent addition to your car accessories kit. Comes with power time out control, to save energy and power. Portable and handheld can be used to find your way on city walks. The unit includes evaluation GPS software. For best results we recommend purchasing GPS software from your home country that best covers your region of the world. 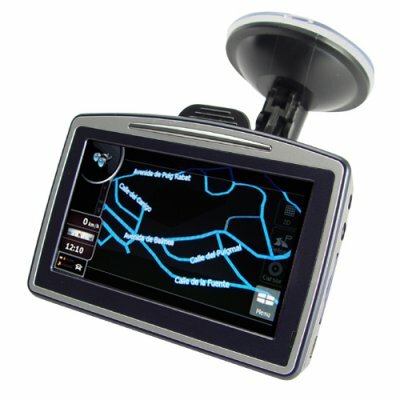 NOTE: This model is compatible with most brands of GPS software - however hardware specific software such as Garmin may not run on this unit. As the wholesaler, Chinavasion provides the GPS-enabled hardware only, not the software. Chinavasion provides no warranty or customer support regarding GPS software. Chinavasion cannot provide downloads / links / advice regarding GPS software. Any software installation you undertake should be performed or supervised by a professional. Very good quality, fantastic screen, very streamlined design and powerful performance. The FM transmitter is very useful option for use in noisy roads. As cellphone hands free is also a life saver. I've worked with this device and it brings you where you want to go without an error.....door to door it will bring U.....quick satellite fix....and the bluetooth connection with my nokia N82 and wrist phone works very well......same device from TomTom will cost U 250 euro.....!!!!! !